Heat oil into a hot pan. When super hot, pour small soup paddle of batter into the centre of the pan. With the back of a spoon, spread the batter evenly round in the base of the pan. Fry for about 2 minutes or more or until one side is fully baked & with help of a pancake flipper & fork, flip the pancake over & fry the other side for 1 minute or more, until fully baked. Repeat. Re-oil your pan if you need to. Stack the pancakes onto a clean big plate & place another big plate on top of it to keep warm. Makes 6 thicker pancakes! To serve: Top a pancake with the lovely warm sauce on top! Yummy!! 🙂 ♥ Stay Tuned & subscribe by email! Join 1,850 email subscribers now!!! It is free!!!! Click the photo link here below to subscribe!!! Treat yourself to my Free E-Book: Healthy Vegan Christmas! 10 new unpublished recipes of me & 8/10 are also gluten-free! 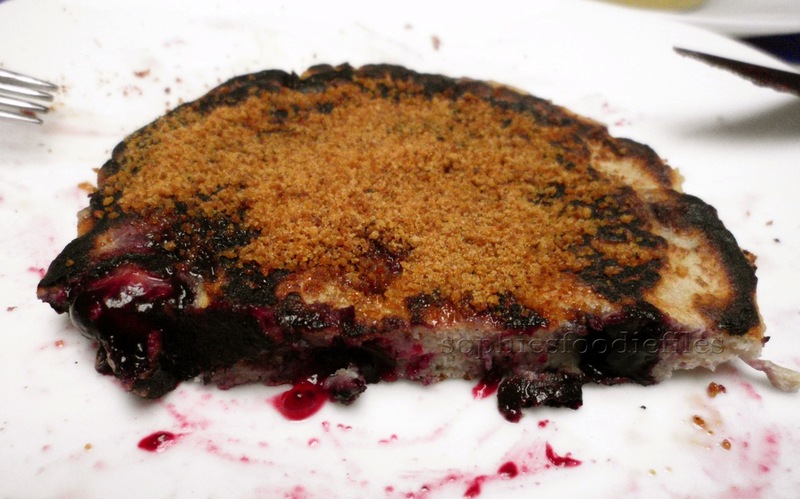 Sourdough Blueberry Vanilla Pancakes made with leftover sourdough starter! 1. Take medium bowl & ad first 5 ingredients. This is the sourdough starter, flax egg, vanilla cane sugar, oil & baking soda. Whisk well together with a small whisk. Finally, add the blueberries. Whisk again. Your sourdough pancake batter is now very bubbly! Ready to fry your pancakes in a medium-hot non-stick pan. 2. I used a smaller soup ladle to pour my batter into the hot pan. I don’t use oil because there is already oil in the batter. Fry pancakes for a few minutes until there are many bubbles on top & check with a fork if the pancake is already getting brown on the pan side. Carefully flip over with pancake flipper & fry for another minute or so. Keep pancakes warm with foil. Enjoy with some good maple syrup! You can really taste the vanilla & blueberries & the pancakes are a bit sweet on their own. MMM! Are you getting into the spirit of Christmas yet? I know I am!!! This morning, when I invented & made these glorious Christmas inspired pancakes it started to snow,…ooh yes,…and a lot too! 1. First, make your sauce. Add frozen red currants, vanilla sugar & water into a cooking pot, stirring often, bringing to the boil. The sauce need to thicken. I serve my sauce half warm. Keep warm. 2. In a bowl, ad all dry ingredients. This is the buckwheat flour, almond flour, baking soda & vanilla cane sugar. Mix well together. See that there are no lumps from the almond flour. 3. In another small bowl add wet ingredients. These are the flax eggs & almond milk. Whisk together. Subscribe By Email + Get Free E-Book: Healthy Vegan Christmas! 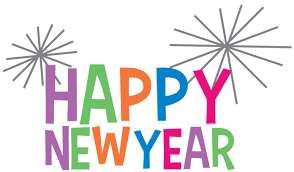 Just click onto the photo below! 11 new unpublished vegan recipes & 8/11 are also gluten-free! I have a version for IMac, Ipad & Iphone & version in pdf! 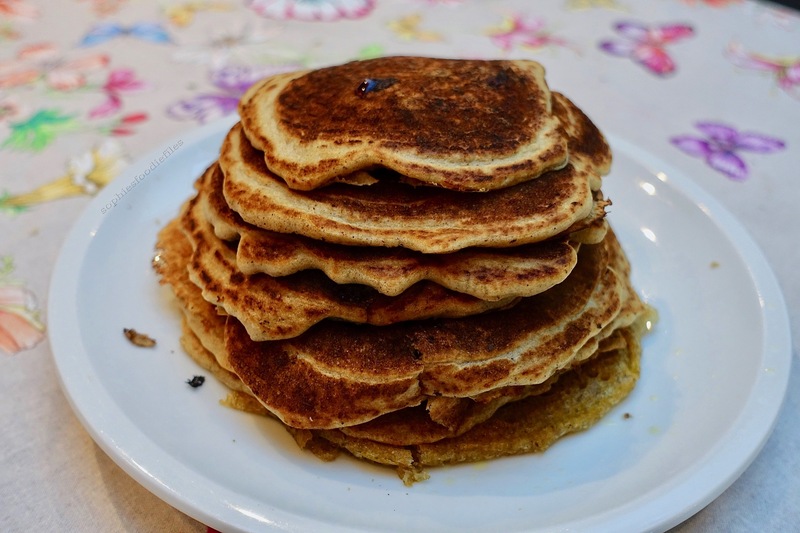 Vegan Gluten-Free Spiced Chestnut Pancakes! Do you know what chestnut flour is? My chestnut flour is made out of milled peeled roasted chestnuts. It has a mild brown color & has a special taste, a more nutty sweet flavor. Chestnut flour is also very healthy. It is low in calories, is low-fat because it is mostly starch. Chestnut flour has a lot of good fiber in them, about 8 gr/100 gr chestnut flour. It also has a lot of vitamin C. It is also rich in folic, like in green veggies. It also has a lot of good minerals, zinc, calcium, magnesium, manganese & phosphorus. It also has a good amount of potassium: 518 mg / 100 gr. So, it is unbelievably good for you! Prior to this post, I made a vegan chestnut bread. You can read all about it here! 1. Make your easy batter! Take a medium bowl & add all ingredients. Whisk well together. You don’t want any lumps left! 2. Fry pancakes! Fry your pancakes in hot sunflower oil. Fry your pancake until many bubbles appear on the surface & then, carefully flip pancake over & fry the other side for 1-2 minutes. Stack pancakes onto a big plate & keep warm. Re-oil your pan every time. You will end up about 9 smaller pancakes. 3. Top with good maple syrup or some coconut sugar! Enjoy with a loved one! 🙂 You can really taste the chestnut, hint of garam masala & then the yummy topping! 2 really fill you up! ♥ Stay Tuned & subscribe by email! Join 1,850 email subscribers now!!! It is free!!!! Click the photo link here below to subscribe!!! Treat yourself to my Free E-Book: Healthy Vegan Christmas! 10 new unpublished recipes of me & 8/10 are also gluten-free! 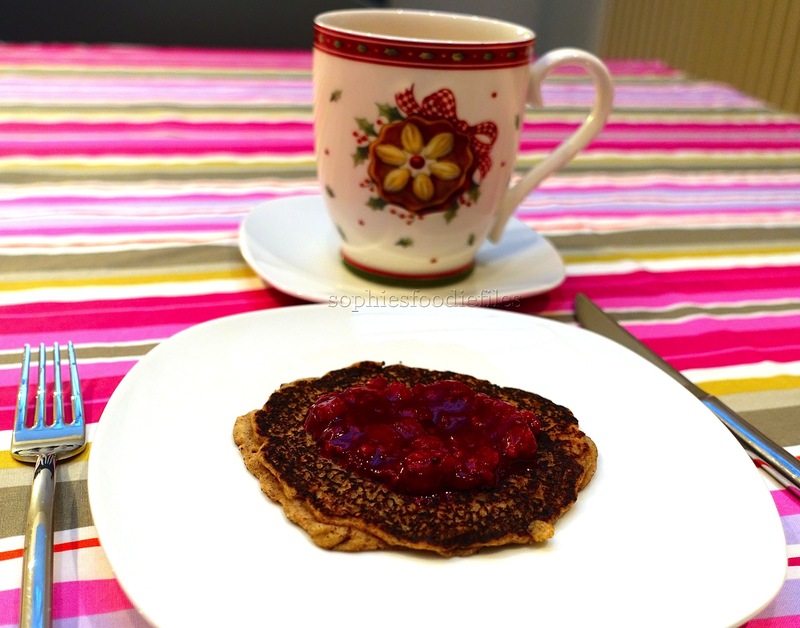 These lovely spelt vegan pancakes are so easy to make yet they are filling. This is a very delicious breakfast or brunch dish! Enjoy! Take a medium bowl & add all wet ingredients for the pancakes. Mix with a small whisk. Now, add bowl of dry ingredients to the bowl of wet ingredients. Whisk together. There must not be any lumps! Place bowl with batter into the cold fridge for 15 minutes until thicker. Make small thinner pancakes. 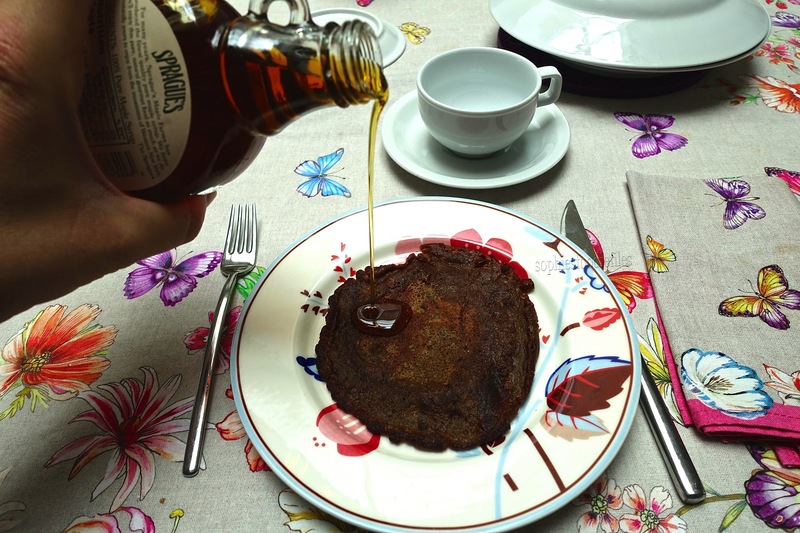 Fry your pancakes in hot sunflower oil. Fry your pancake until some bubbles appear on the surface & then, fry the other side for 1-2 minutes. Re-oil your pan every time. Stack them on a clean plate that you topped with aluminium foil to keep them warm. 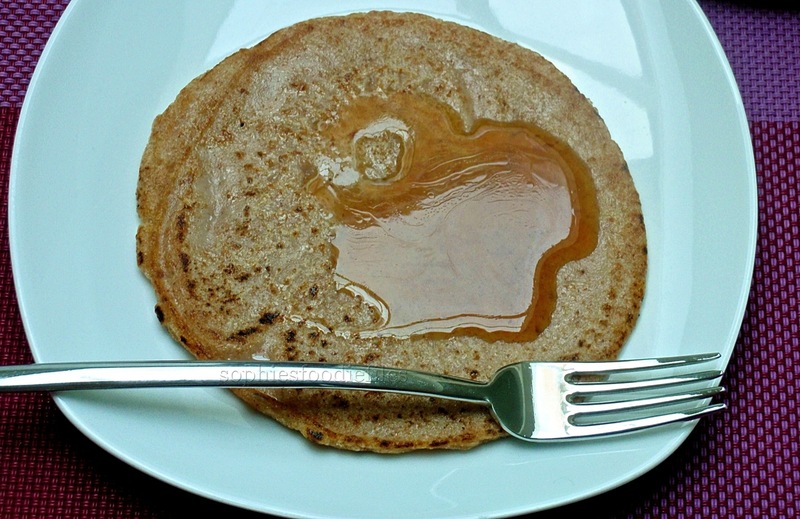 Plate up & enjoy with some good maple syrup drizzled over them or topped with coconut sugar! Yummmmm! ♥ Stay Tuned & subscribe by email! Join 1,850 email subscribers now!!! It is free!!!! Click the photo link here below to subscribe!!! Treat yourself to my Free E-Book: Healthy Vegan Christmas! 10 new unpublished recipes of mine & 8/10 are also gluten-free! 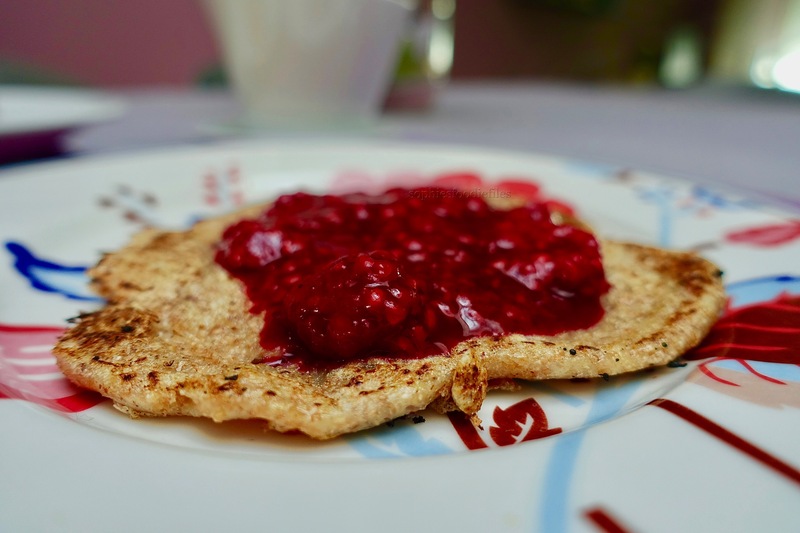 Gluten-free Vegan Blueberry Buckwheat Pancakes! A lovely tasty healthy breakfast! That is a mouthful, hey? 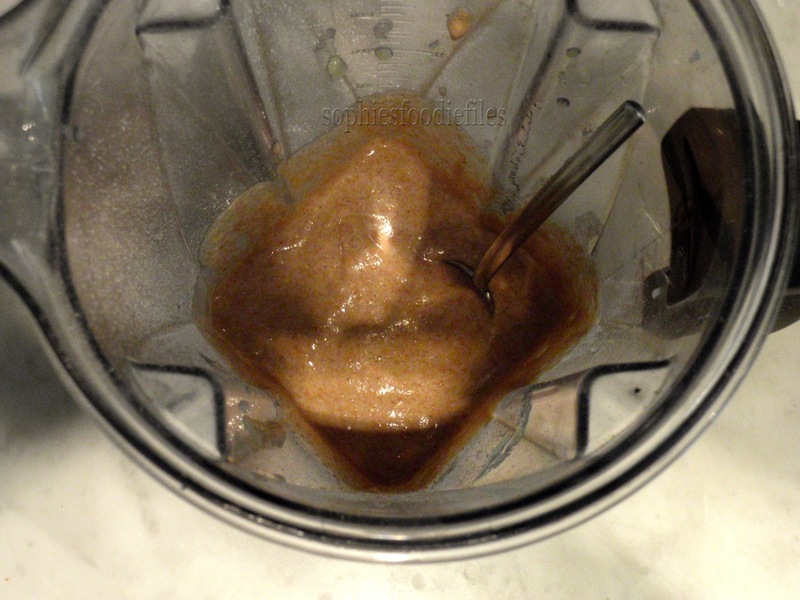 I had some nice wholemeal buckwheat flour left that I needed to use up. I thought that home-made ground oat flour would go well with this lovely buckwheat flour. 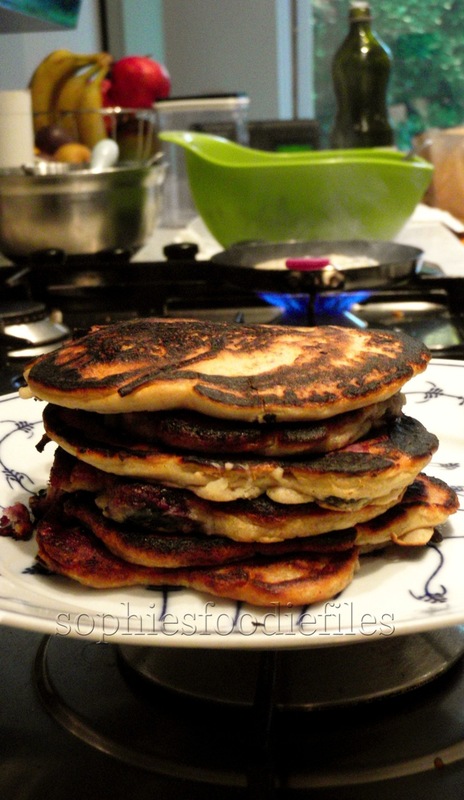 I had some fresh blueberries that I wanted to use in these lovely pancakes! They are super scrumptious, healthy & filling too! My husband Peter gave them 10/10! Ooh yes! Topped with some coconut sugar,…To die for really! Take a medium bowl & ad 3 dry ingredients. This is buckwheat flour, oat flour & baking powder. Mix with a spoon. Set aside. Take another medium bowl & add wet ingredients. This is soy milk, apple compôte & vanilla extract. Mix well with a small whisk. Now, pour wet ingredients into bowl of dry ingredients. Mix well until all dry ingredients are fully mixed in. Lastly, fold the blueberries into the mix. Heat up a non-stick small pan & heat up on medium-high. Smear in with a neutral extra virgin olive oil & heat up. 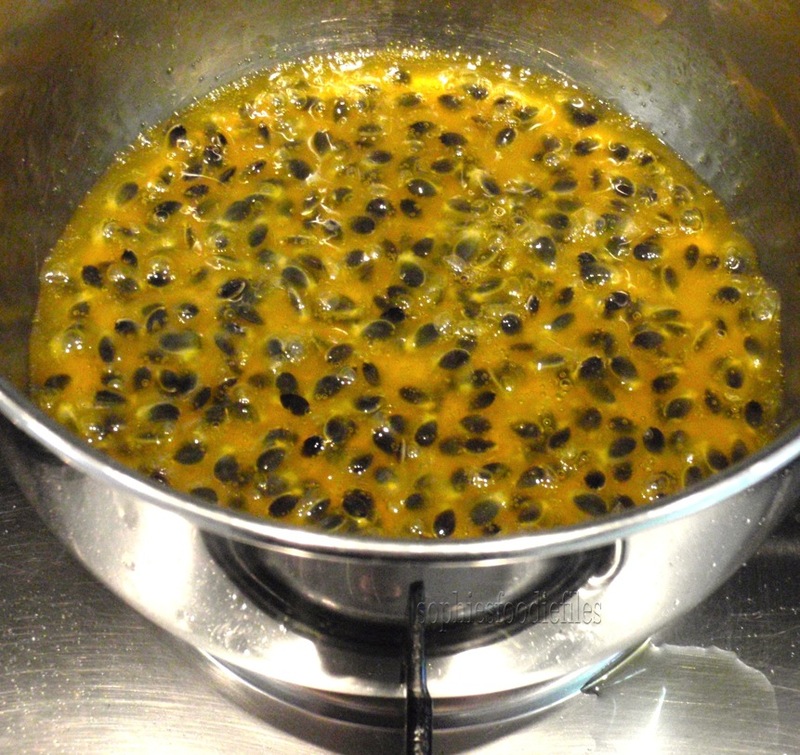 Pour 1 heaped big tablespoon into the center of the hot pan & see that you have a few blueberries in them. Flatten it all out with the back of your spoon to form quickly a roundish shape for your pancake. Wait until many bubbles appear into the surface of the pancake & carefully flip your pancake over with help of a pancake spatula & fork. With your pancake flipper, push the upside of the pancake down for an equal fry. When done, place onto a plate that you lined with aluminium paper to keep the pancakes warm. Repeat the process. I oiled my pan again & again. When all the pancake batter has been used up, serve at once, like photo above & enjoy with some coconut sugar on top or with some good maple syrup! 🙂 I got 16 smaller thicker pancakes from the batter! ♥ Stay Tuned & subscribe by email! Join 1,800 email subscribers now & get my 1st E-Book: Healthy Vegan Christmas now! It is free!!!! Click the link here below to subscribe!!! Vegan pineapple chocolate chip pancakes! You can also find this tasty recipe HERE ON INSTRUCTABLES! 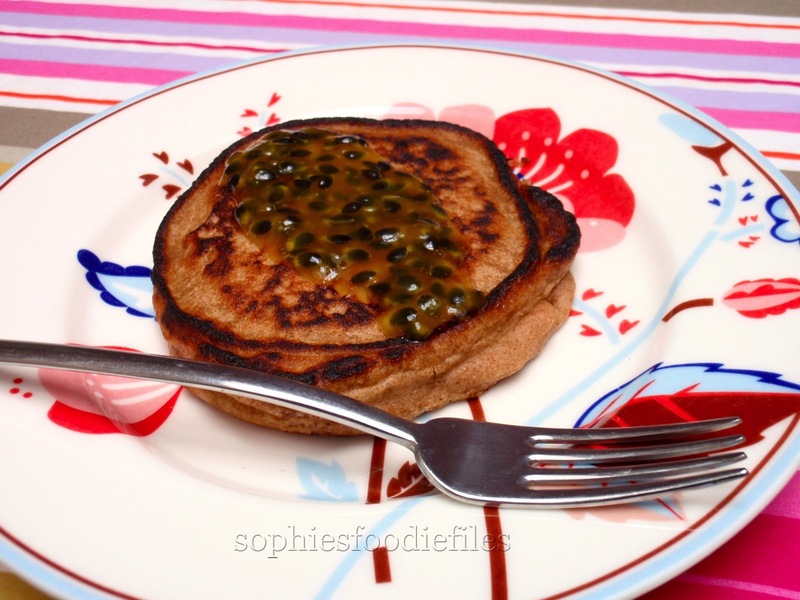 Vegan spelt pancakes with passionfruit glaze! 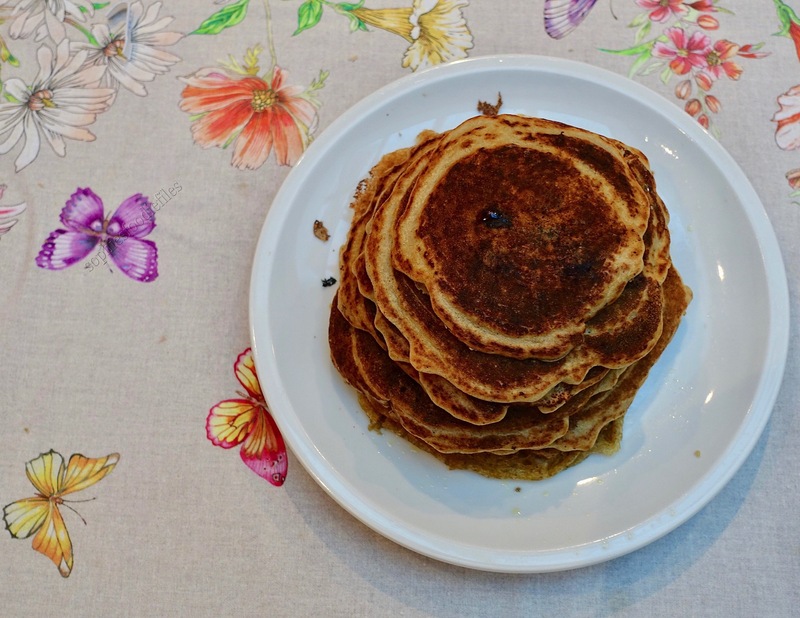 Recipe: For 6 smaller fluffy vegan pancakes! Form & fry your pancakes. Take a small pancake pan & smear it in with a fruity oil. Heat up on medium-high. Spoon 2 big small spoonfuls of the dough into your pan & flatten it all out with the back of your spoon to form quickly a roundish shape for your pancake. Wait until bubbles appear into the surface of the pancake & carefully flip your pancake over with help of a pancake spatula & fork. With your pancake flipper, push the upside of the pancake down for an equal fry. When done, place onto a plate & repeat the process. I oiled my pan again & again. When all the pancake batter has been used up, serve at once, like photo above & enjoy! 2 pancakes will be enough because they really fill you up & that is what you want! 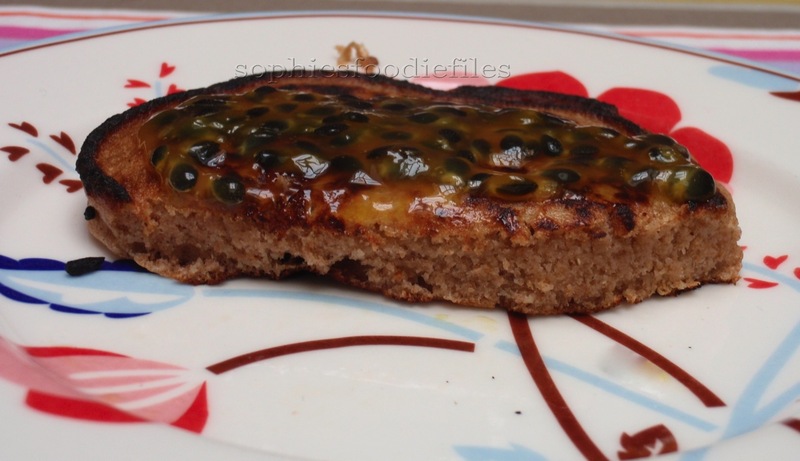 The pancake itself is a bit sweet, thick & fluffy & the passionfruit glaze on top is also a bit sweet & so addictive as well. Enjoy, sweeties! Love, Sophie! ♥ Stay Tuned & subscribe by email! Join 1,800 email subscribers now!!! It is free!!!! Click the link here below to subscribe!! !